Bringing smart and climate-friendly energy solutions to a historic and cultural landmark. The City of Trondheim is known as the technological capital of Norway. More than a thousand years old, it is home to a large number of cultural monuments and protected buildings. Together these factors make for a unique playground for innovation. Can historic landmarks be transformed into smart and climate friendly powerhouses? Buildings are responsible for 40 per cent of energy consumption and 36 per cent of CO2 emissions in the EU. The EU has therefore set the target for all new buildings to be nearly zero-energy buildings within 2020. How do we apply the necessary knowledge and innovation to existing building stock? Old buildings and new technologies should have room for each other. The Nidaros Cathedral is the world’s northernmost medieval cathedral and Norway’s national sanctuary. Because of its immense size and construction, the building consumes a lot of energy. In 2017, the Nidaros Cathedral consumed 1.5 GWh of energy, 21 per cent of which was electricity and 79 per cent from district heating. The Cathedral is now about to change its entire lighting system. This provides a good opportunity to examine its total energy performance and make plans for green solutions. Norway’s first new-built Powerhouse will soon be realised at Brattørkaia by the Trondheim Fjord. It produces more clean and environmentally-friendly energy than it consumes. Is it possible to turn Nidaros Cathedral into a renewable energy producing “Powerhouse” in the same way? There is potential to make the historic and religious monument power-generating in more ways than one. Deep energy retrofit and smart energy management of large historic monument, taking into account cultural conservation and user experience. Transforming a historic urban district into a smart energy system with decentralized production of renewable energy. Proposals can be submitted from 24 March until 31 May 7 June 2018. Pre-selection will take place in early June and five finalists will be selected and announced in June. The selected innovators will be invited to a boot camp, site visit and final pitch in Trondheim by the end of August, during Trondheim Playground (27-28 August 2018). Travel costs for up to three members per accepted proposal will be reimbursed by EIT Climate-KIC in accordance with the terms and conditions provided (see the Competition Manual). The winning proposal will receive professional advice and assistance by EIT Climate-KIC on how best to progress with turning their idea into reality. We highly recommend that you read this document carefully before submitting a solution. Please download the competition manual here. 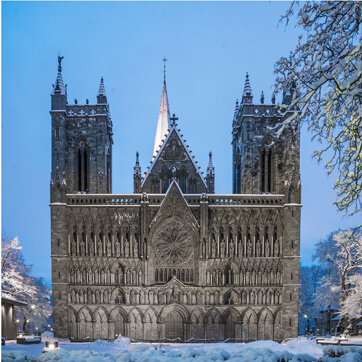 Help us to transform Nidaros Cathedral into an energy-smart building! All solutions must be presented via this submission form. Submissions that are not sent via this route will not be considered. We are hosting a webinar on 29 May 15:15-16:00 CET to answer any questions related to the competition. Please register for the webinar here. Q: Is there a ventilation system is in place? A: No. Nidaros Cathedral does not have a ventilation system in operation for the time being. Q: Do you have some information for how many hours the central heating system was turned on for example during January 2017? A: The system works non-stop. Motorized valves regulate after zone sensors temperature settings. Q: What is the operational (setting) temperature in church? It seems that in July 2017 heating system was running despite average outdoor temperature 14 C.
Q: Are radiators equipped with some thermostatic values? A: No, by zone sensors. Q: Are there simple radiators or some kind of air heating? (radiator with fans) ? A: No, only simple, old radiators. Q: What is the reason for the 20% decrease in energy use from 2016 to 2016? Q: What is a central heating water temperatures (supply and return) Is it 80C/60C, or maybe more? A: Supply winter: 70-90 C. Supply summer: 45-70 C. It’s regulated with curve-based parameter from outside temp. We do not have data on the return temperature. Last updated 29 May 2018.